Breitbart.com serves as the communications arm of a web of nonprofit and for-profit entities owned or supported by hedge fund billionaire Robert Mercer and his daughter Rebekah. The conservative website shares staff with those organizations and regularly promotes their work. 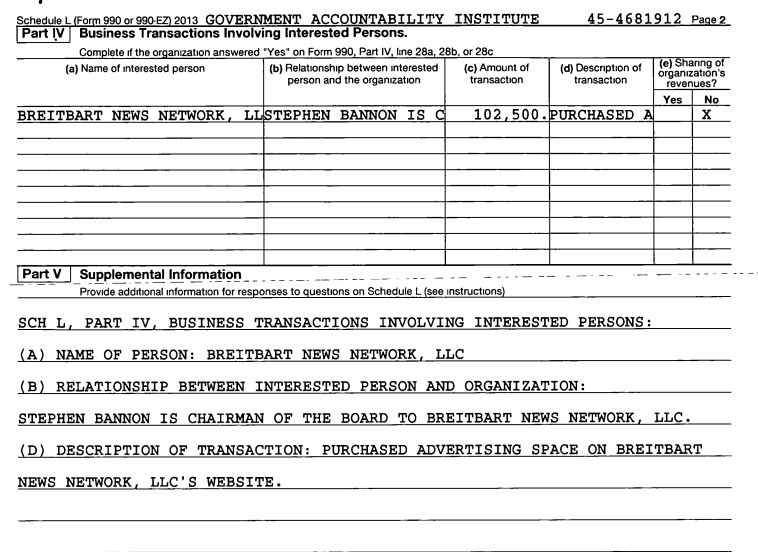 White House chief strategist Stephen Bannon was executive chairman of both Breitbart and the conservative research organization Government Accountability Institute (GAI) from 2012 to 2016. Breitbart Managing Editor Wynton Hall and Senior Editor-at-Large Peter Schweizer also serve as GAI’s communications strategist and president, respectively. The Mercers are part-owners of Breitbart and their foundation is GAI’s primary funder. The committee that handles congressional press credentialing is currently reviewing Breitbart’s claims of editorial independence in response to the website’s bid for permanent credentials. The committee has to this point denied Breitbart’s request and has expressed concern about Breitbart’s practice of sharing key staff with GAI and its connections to the Mercers. A Media Matters review of the website’s reporting finds that these concerns are justified: Breitbart regularly promotes the research and films generated by its owners’ and top editors’ other projects. 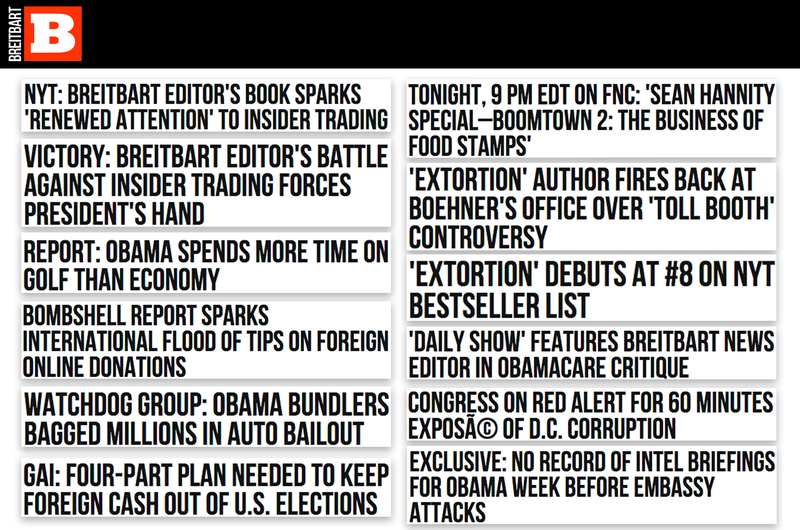 In hundreds of articles over the past six years, Breitbart’s reporters have produced what amounts to press release copy for GAI, highlighting its findings, aggregating stories about politicians responding to GAI’s reports, and posting videos of GAI leaders -- who are also Breitbart editors -- discussing their work on television. The conflicts of interest don’t stop with GAI. Bannon and the Mercers also co-founded and own the film production company Glittering Steel; Breitbart’s editorial resources have been used to promote that firm’s documentaries. This intermingling of private, news, and nonprofit organizations culminated in the production and promotion of Clinton Cash, the 2015 anti-Clinton book authored by Peter Schweizer, reportedly based on research he led at GAI. 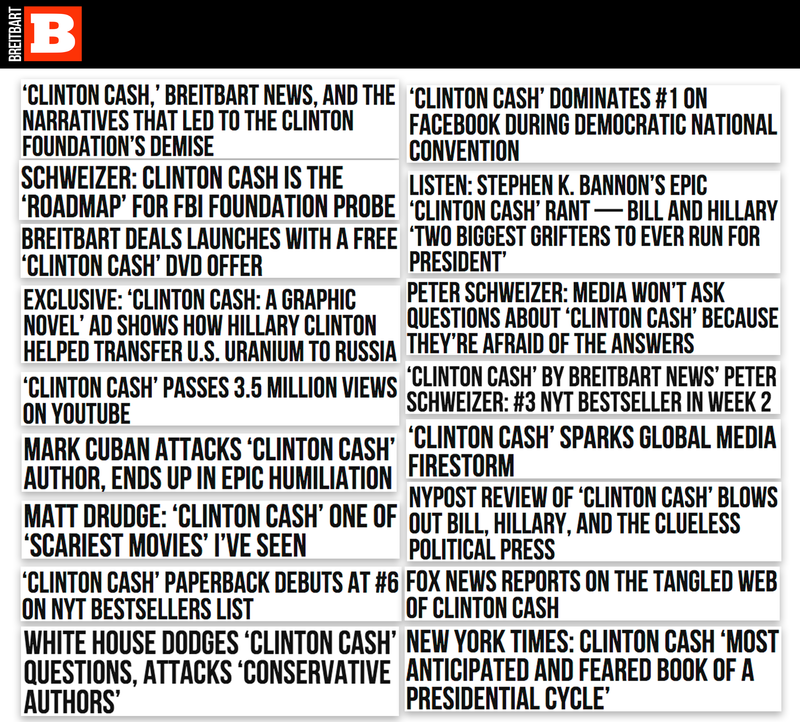 As Bannon himself explained in a 2015 interview, Breitbart was a key cog in the Clinton Cash rollout strategy, producing more than 400 articles covering every aspect of the book. Glittering Steel then turned the book into a documentary -- produced by Bannon, Schweizer, and Rebekah Mercer -- that was also heavily promoted by Breitbart. 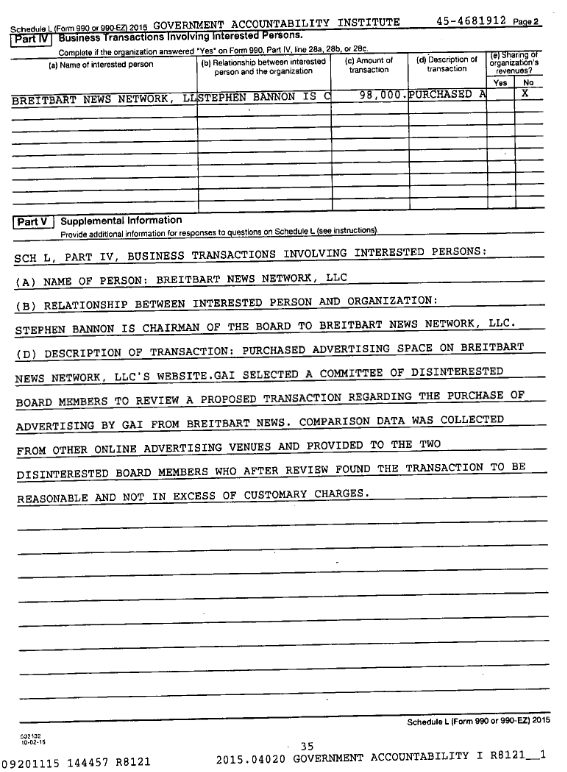 Hall and Schweizer have additional conflicts of interest outside of GAI: they also own communications firms which offer their ghostwriting and public relations services to corporate and political clients. While these firms do not publicly disclose their clients, Media Matters identified at least one case in which Breitbart heavily promoted a book ghostwritten by Hall without disclosure. At every turn, this web of financial interests created unparalleled journalistic ethics quandaries that refute Breitbart’s claims that the site functions as a news organization independent from other groups. 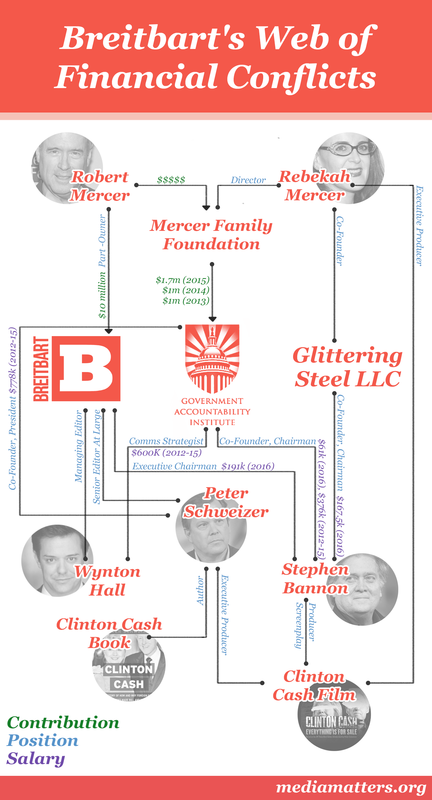 The Mercers fund a sprawling conservative political empire that includes the media outlet Breitbart, nonprofits like GAI, and for-profit companies like Glittering Steel. Stephen Bannon advises the Mercers on their political spending and frequently leads the organizations they back, including Breitbart, GAI, and Glittering Steel. Peter Schweizer is a conservative activist and author who worked for President George W. Bush and former Alaska Gov. Sarah Palin. His research provides the ammunition for the Mercer-funded, Bannon-directed conservative attack machine. He develops research at GAI and writes about it at Breitbart. Schweizer Has Promoted His Other Interests In More Than 20 Percent Of His Breitbart Posts Since 2012. Over the past five years, Schweizer referenced his books or his GAI organization in 12 of his 53 Breitbart posts, according to a Media Matters analysis. 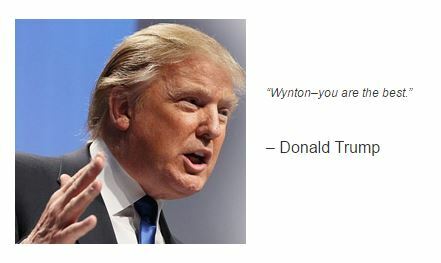 A conservative activist and author, Wynton Hall weaponizes the research Schweizer develops at GAI, often through his role as a top Breitbart editor. The website has also promoted Hall’s ghostwriting clients. Of concern to the committee was the presence on the masthead of at least two people, Senior Editor-at-large Peter Schweizer and Managing Editor Wynton Hall, who are both also both part of the Mercer-funded Government Accountability Institute founded by Bannon and Schweizer. The GAI and the work they produce, (sic) would not be in line with the committee’s guidelines for credentialing, the committee said. another 61 articles published from May 5, 2015, to June 4, 2015, the month after the book’s publication. As Bannon suggested, Breitbart aggregated other news outlets’ reports on the book, highlighted Schweizer’s interviews, flagged controversies emerging about the book’s critics, complained when mainstream outlets weren’t giving it sufficient attention, cheered its sales figures, pointed out comments related to the book from Democrats and Republicans, and otherwise pushed its message relentlessly.